"Stop trying to make me mad," Ray muttered. Jauge's grin vanished. "That's all you're meant to be," Jauge said. Ray fought back the fury that rose in her chest at Jauge's condescending tone. "You don't know what you're looking for, Ray. You don't know what your home is. What questions would get you there?" "My home is in Phoenix," Ray said. "And Phoenix is hot, isn't it?" Jauge said. "The sky burns you?" "My home is in Phoenix," Ray said, more fiercely. "Odd, then, that you should find yourself in a forest in late autumn," Jauge continued. "Odd that you should recognize me, when I've never seen a desert in my life." A scientist mad with grief; a mother trying to escape guilt; a little girl's worst nightmare; a mistake with unforeseen consequences. What if your life--your world--your memories--were a lie? Nothing can be taken for granted. Nothing is as simple as it seems. Each person holds a different shard of the truth, and none of them are eager to share it. 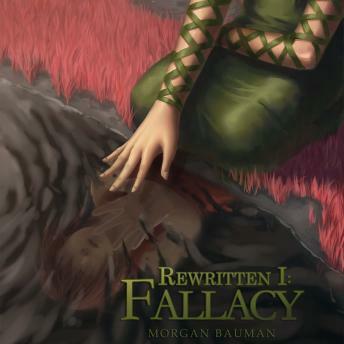 Fallacy is a dark fantasy novel set in the world of Qol, and it is the first in the four book Rewritten arc by author Morgan Bauman.